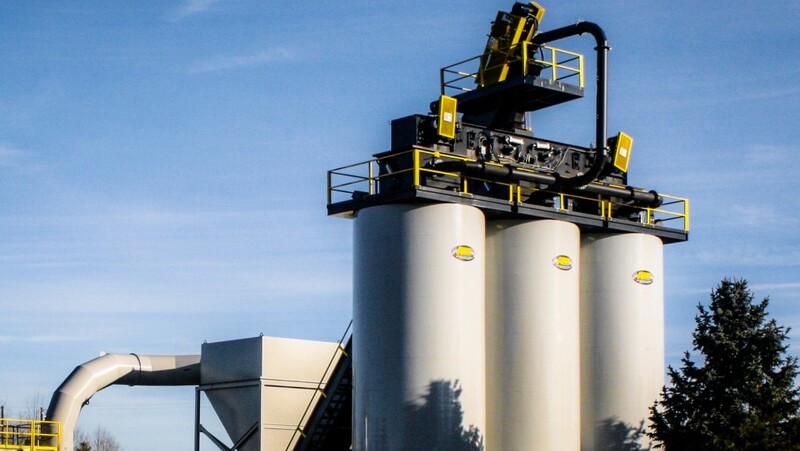 Asphalt Drum Mixers offers crane-set and self-erect asphalt storage silos, which are compatible with both the company’s own and similar competitive models of asphalt plants. Available drag conveyors from 150 to 500 tph help deliver the freshly mixed asphalt to the storage silos, where its temperature is maintained until discharged. ADM manufactures each silo with a heavy-duty steel design and continuous welding throughout. All crane-set silos come with an enclosed batcher with a dual clamshell gate that greatly reduces the risk of product segregation and coning. All models incorporate safety features such as a skid-resistant maintenance platform, top perimeter guardrail and solid-steel toe-stop kick plate. In addition, a 4-inch fiberglass dual layer blanket insulation at the barrel provides superior heat retention for the stored hot mix asphalt. ADM equips all models with alarms to alert operators when asphalt levels are high. The silo cone has a 60-degree taper to a 30-inch discharge opening. The cone is double welded to the silo barrel, which extends past the cone. The cone is heated with pressure tested hot oil tubes and has 4 inches of insulation embossed with a stucco finish. Asphalt producers also have the option to choose an electric heating system to maintain the asphalt at the desired temperature. Producers can equip all silos with low material signal alarms and standalone remote level monitors and displays. All silos may also feature optional remote location lubrication systems and AR or ceramic cone liners and drag conveyor floor liners. Other options include a heated silo barrel, safety gates, heated gates, gate seals, blue smoke recovery systems, air supply systems, drag conveyors, transfer drags for multiple silo configurations, and a loadout system. The crane-set models are available in 100-, 150-, 200- and 300-ton capacities with portability options available for the 100-, 150- and 200-ton capacity silos. Producers transport crane-set portable silos using a built-on gooseneck with a fifth-wheel kingpin hitch and dual-axle air ride suspension. The self-erect silos are available in 30-, 50- and 75-ton capacities. The self-erecting silo is raised using heavy-duty cables attached to the silo and the drag conveyor. The drag conveyor is raised using a hydraulic cylinder system. Self-erecting silos and the drag conveyor are supported on a heavy-duty steel tubing frame that provides for an 11-foot, 2-inch wide x 11-foot, 3-inch high drive-through clearance. Producers transport self-erect silos on a gooseneck trailer with a fifth-wheel kingpin hitch. A trailer with a quad-axle and air ride suspension supports large units. Small and midsized trailers feature leaf spring suspension and either a tandem or tri-axle. The silo and conveyor pivot into the upright position quickly and easily.